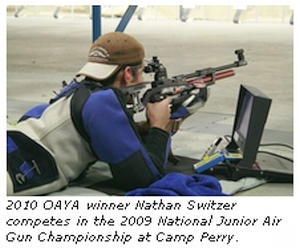 Do you know a talented junior shooter who could use $5000.00? Well here’s an opportunity. Applications are now being accepted for the Brownells/NRA 2013 Outstanding Achievement Youth Award. Chosen for their accomplishments in the community, the classroom and the shooting sports, three exceptional young people will receive a total of $10,000 courtesy of Brownells. First place wins $5,000, second place takes home $3,000 and third place will recieve $2,000. Eligibility requirements are explained below. While only the top three candidates will get cash prizes, all qualifying entrants will receive an official NRA Youth Award Certificate and Medal. In addition to the Core Requirements, candidates must complete a minimum of five (5) Elective Requirements out of 19 possible options. Many fun activities qualify. Here’s a partial list: compete in an NRA Postal Match; attend an NRA Shooting Sports Camp; join a local shooting club; participate in a summer camp shooting program; visit a Firearms Museum. CLICK HERE for Full List of Electives. Deadline to enter is May 1, 2013. CLICK HERE for Application Form. If you have any questions, contact the NRA Youth Programs Department at (703) 267-1505 or email oayaprogram [at] nrahq.org. Share the post "NRA and Brownells Offer Youth Achievement Awards"